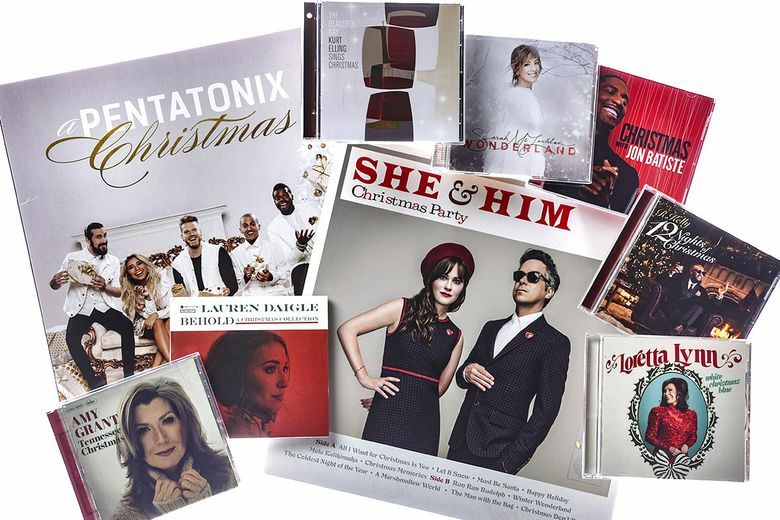 Some of the new Christmas CDs out this season. New Christmas music from pop, R&B, jazz, gospel and country artists includes covers and some intriguing originals. The cozy benevolence of Sarah McLachlan’s voice is the constant on an album that puts considerable thought into customizing familiar songs. There are echoes of Phil Spector and the Beach Boys in the steady quarter-note chords behind “Let It Snow.” “Away in a Manger” arrives with a different melody, as a countryish waltz with vocal harmonies from Emmylou Harris; “Huron Carol,” a Celtic-tinged Canadian hymn, gets full orchestral drama. Some choices are fussy and overblown, but McLachlan’s voice always provides warmth. There’s a charming intimacy to much of this album, which Jon Batiste made on the side during his first year as bandleader for “The Late Show with Shttp://www.seattletimes.com/wp-admin/admin.php?page=curation_menutephen Colbert.” The style runs from spare to plush, with Batiste’s soulful piano, voice and melodica as abiding constants. What better turn than a Christmas album for an artist whose mission is to uphold tradition under the cover of mild subversion? Kacey Musgraves’ first holiday album is by and large delightful, full of sweet, measured singing; varied arrangements, from Western swing to vintage soul. There are also four originals, the best of which is “A Willie Nice Christmas” (featuring Willie Nelson), on which she sings, over Hawaiian guitar, “I’m gonna wrap my presents up in red bandannas / and leave some special cookies out for Santa.” Get it? The cookies have marijuana in them. They’re marijuana cookies. For Santa. “Mrs. Santa Claus / This year will be, this year will be / the year I make holiday love to you”: R. Kelly would like to bring you tidings of comfort and joy and maybe some other things too. “12 Nights of Christmas” is his first holiday album in a two-decades-plus career toggling between the carnal and the spiritual. He doesn’t take the challenge lightly on this ambitious album: There are a dozen songs, all originals. Some are perfectly pleasant, others, like the afore-quoted “Mrs. Santa Claus,” are transfixing. The manger isn’t far from the honky-tonk on Loretta Lynn’s Christmas collection, which has songs from the trove of recordings she began making in the 2000s with Johnny Cash’s son, John Carter Cash, at the Cash Cabin Studio. Lynn’s voice is pure Appalachia, with openhearted respect in religious songs and a touch of swing on tunes like “Blue Christmas.” The arrangements hark back to the down-home understatement of 1960s country, placing just the right piano tinkle or steel-guitar turn between verses. You can hear the Louisiana seeping through “Behold,” the impressive holiday album by Lauren Daigle, her generation’s most promising singer of contemporary Christian music. Sometimes it’s in the arrangements, like on “Jingle Bells,” which pulses with New Orleans-informed jazz and swing. But mainly her home state is in her voice, which unlike that of many of her genre peers, is rife with ambiguity, not clarity. Perhaps you have listened to the youngish country star Eldredge and wondered just how, even in these polyglot, borderless, permissive times, he makes sense in Nashville. If that city has lately been dominated by bros, he is a gentleman; his twang feels digitally augmented. “Glow,” his first holiday album, makes the disconnect clear: It turns out Eldredge is a disarming crooner deeply at home in front of a big band. If there’s no room in country music’s mainstream for Jennifer Nettles’ gargantuan voice, it’s a relief she found the willing canvas of holiday music. These standards don’t just forgive elegantly shouted singing, they encourage it. So Nettles howls on “O Holy Night,” leans into “The First Noel” with dignity and fire, and brings sass to “God Rest Ye Merry Gentlemen,” an ice-cool duet with Andra Day. How long has it been since Pentatonix, the wildly popular, pneumatically precise a cappella group, last released a holiday album? Two years, since “That’s Christmas to Me,” which sold more than 2 million copies. If you liked that album, there’s no reason you wouldn’t like this one, which also emulsifies carols and Christmas standards to the consistency of a smoothie.